Hand Warmers - You Bet! What a super thing these are. It says "8 Hours Warmth" or similar. Rubbish!! More like 10-12 hours at full warmth!! Just follow the instructions :- Shake pack. Open pack. Shake pack and put in pocket, glove or similar. Job Done!! One great thing to note for serious winter use (Skiing, Alpine Walking etc) is they they are "100% Airport Security Friendly" The 'pack' is about, width, the size of an AA battery and length, about 1 1/2 AA battery. Perfect for inside a glove! Yes I whole hardheartedly recommend these!! Not quite so hot Hotties! 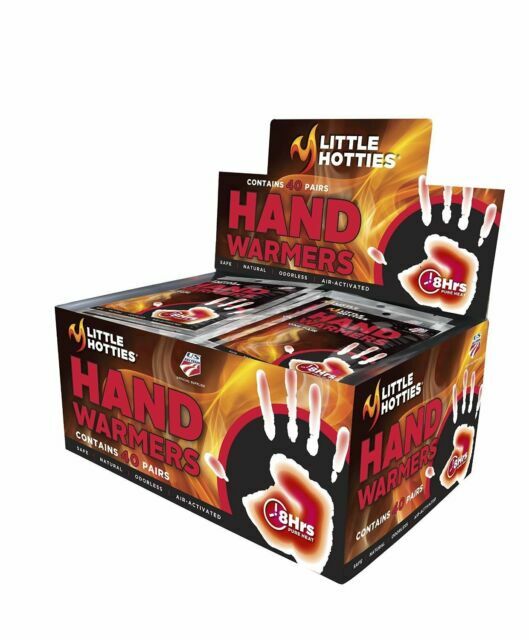 They are presented and packed well and last a good 8 - 10 hours, but they are not as hot as other makes that I have had and cool off very quickly if simply used in the hands. They take a long time to heat up just in the hands! They are best shaken then popped inside your gloves or a pocket.They retain their fairly well when used like this but are comfortably warm rather than hot. they are very good value, with the regard to the 40 pair pack. compared to others of the same type they could possibly stay warmer slightly longer,so not bad for the money. Having spent some 40 days walking out on Exmoor this winter the "Hotties" have been my favourite mate. They last all day and the heat can still be felt on returning home in the late afternoon. I've just ordered another 40 pairs for next winter as they have a good shelf life, nothing like being in front.